The row of lunches to pack each night is waiting for me shortly after we finish dinner together each night. And the apple orchards have announced that the u-pick season has begun. I grew up on a small working farm in Central Washington, with cattle, horses and lots of vegetables. My grandparents were organic gardeners before anyone had really heard of organic gardening. My Mom sorted fruit in a local fruit warehouse, choosing which apples would make it to your shopping basket, and which would be deemed culls. A cull would become juice or applesauce. And while it’s been many years since that land was a farm, there are a few remnants of a simple time that I try to recreate for my own family. Where the pace is a bit slower, the evenings arrive a bit earlier. And food can be enjoyed together from the vine to the plate. We like to enjoy eating outside until bundling up no longer works. There is something about bringing a big pot of soup and a crusty bread to the table, and enjoy the last bits of favorable weather together around the table. I am not sure how this little table will end up as she is in dire need of paint, or something. This drop-leaf table was my Grandmother’s, and in years past was reserved for holidays, big family meals, and cutting fabric. So as long as it’s not raining, or too cold, that’s where you can find us. 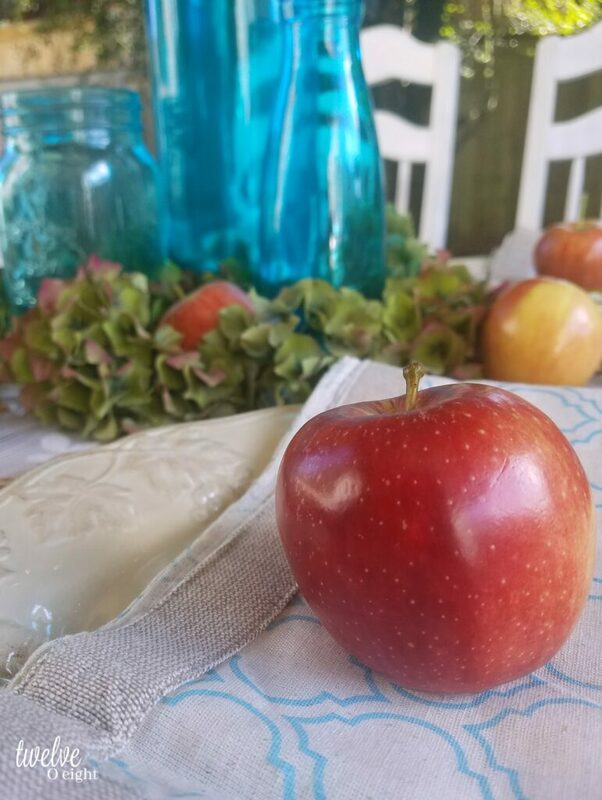 There will be plenty of time to cuddle up around the fireplace inside, but for now, our October table full of apples, and fall goodness is where we like to be. Thank you so much for reading, please Pin and share pretty please! And thank you to the lovely Katrin from Kreative K for putting this all together. 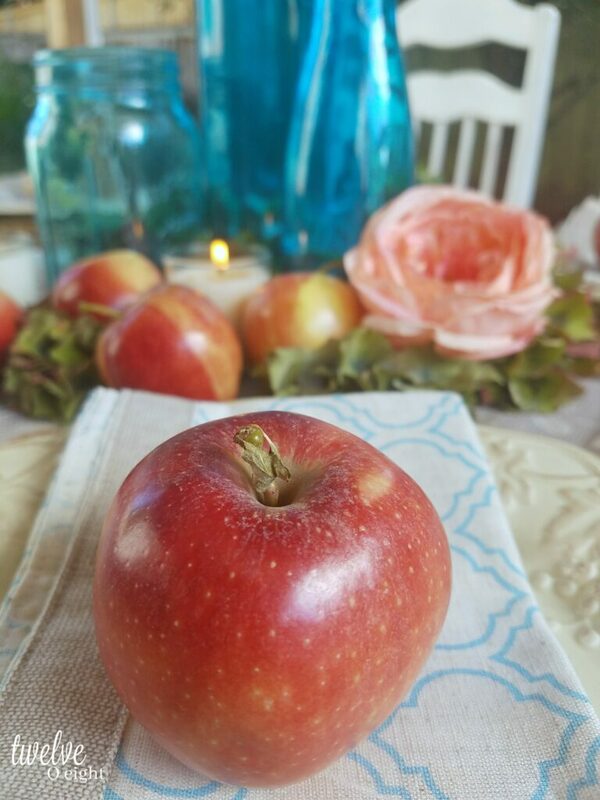 Wishing you a wonderful fall full of yummy apples and good wine. From my little corner of the world to yours. 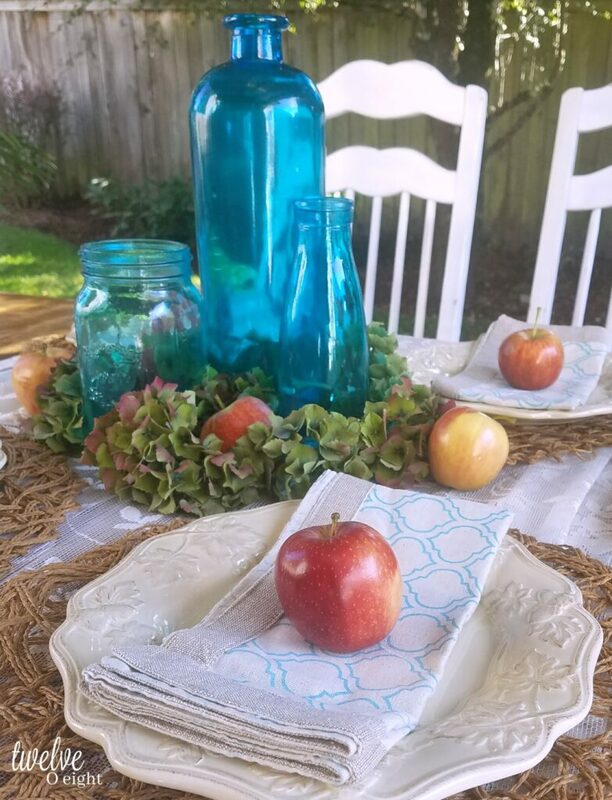 I always enjoy reading your words, and paired with these gorgeous photos of your beautiful October table setting is just the best! It looks magical and I can imagine the nice family time you spend here! You are so sweet Katrin, I really appreciate your reading and thank you for your message. The blog hop was so fun, count me in for others!! Hi Jelica 🙂 thank you for reading and I really appreciate you popping in and leaving your sweet message. We love our apples here! Tanya, I too am so glad to have found a new friend in this blog hop! Can’t wait to follow your posts now! Your photos are so beautiful! I’m In NH so this nice stretch of weather is such a treat. Just tonight we ate out on our porch! So, I’m with you, while the weather is not too cold you can find us outside too. Tanya what a lovely tablescape! 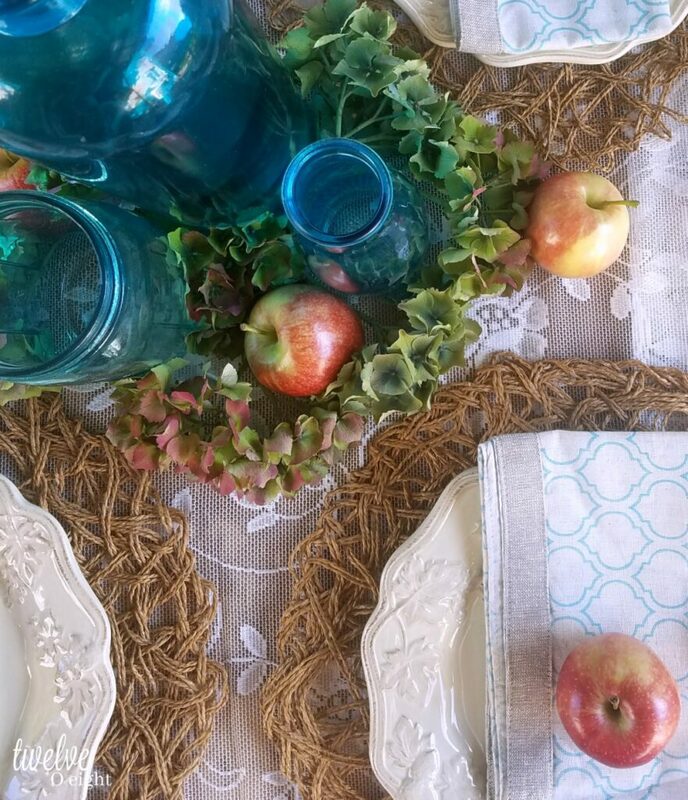 The simple centerpiece is a lovely pop of color. 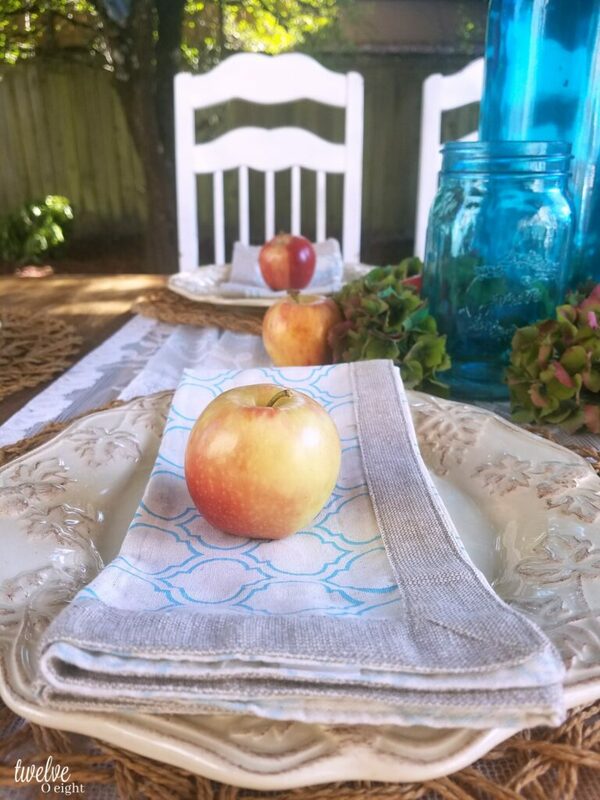 There’s just always something special about dining outdoors. I’m in TN and the weather is still in the high 80’s. So I’m totally with you in enjoying the last of this balmy weather. 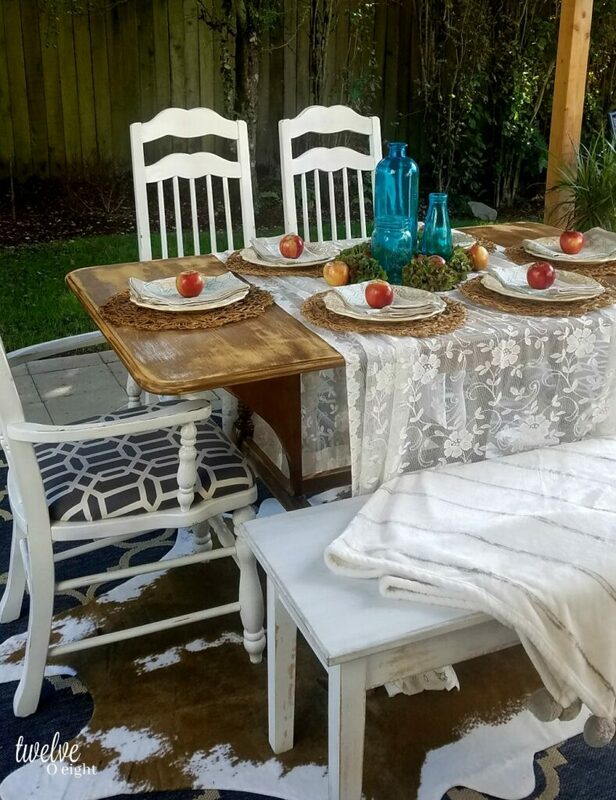 The thought of outdoor dining is superb, Tanya! That is such a lovely table Tanya. 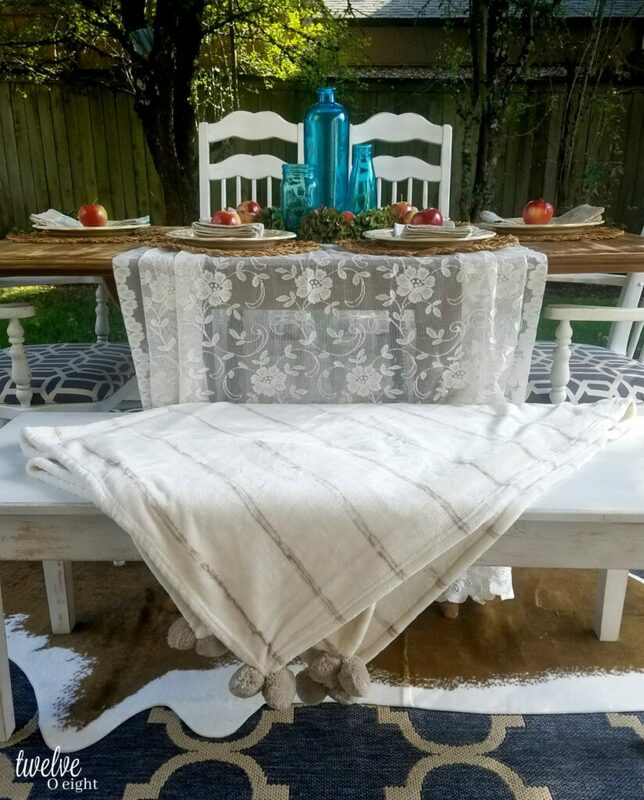 Not just that gorgeous tablescape but the story behind the table as well. It is so nice to be able to hold onto grandma’s table and feel a part of history. Thank you so much Marisa, it was really fun 🙂 I appreciate you stopping in! !